Mother’s Day can be a difficult time as well as a special day for Mother figures. It brings sadness for some and celebration for others. Mother’s of all nature will be cherished this coming weekend, whoever they are to you in your lives; Mothers, Fathers, Grandparents, sisters, friends. As chief feeder in our house, my favourite way to show those I love is via their stomachs. 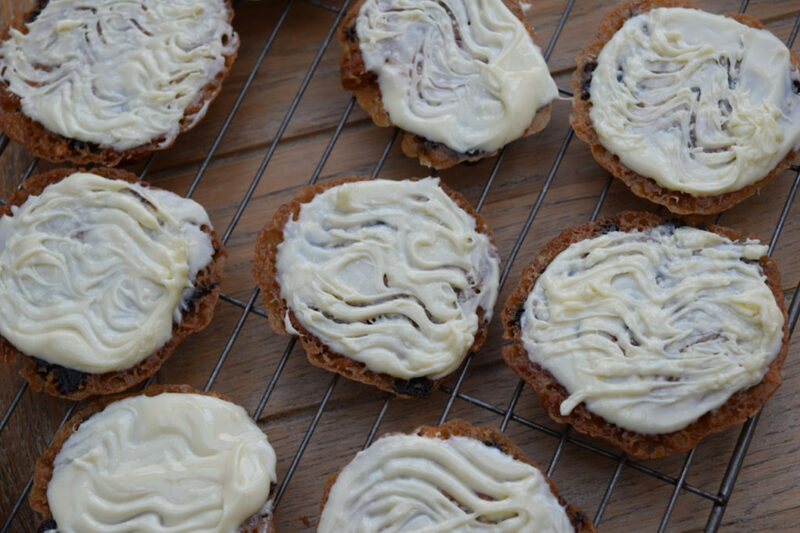 My Mother’s favourite all time treat is a Florentine, so for her, this week I’m sharing these Cherry White Chocolate Florentines. 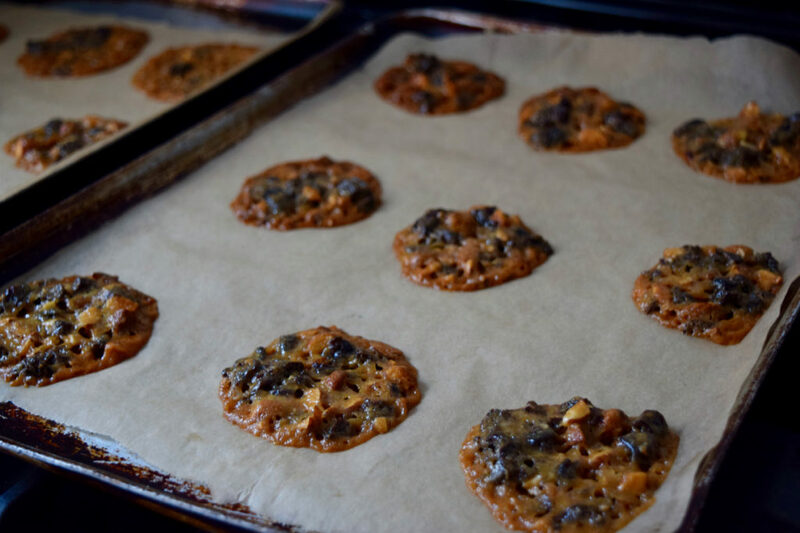 I have attempted to make my Mum Florentines before, but they have failed epically. With such a classic recipe, however, I should have known to have gone to the top for advice, so it’s with thanks to the evergreen Mary Berry for this brilliant interpretation. 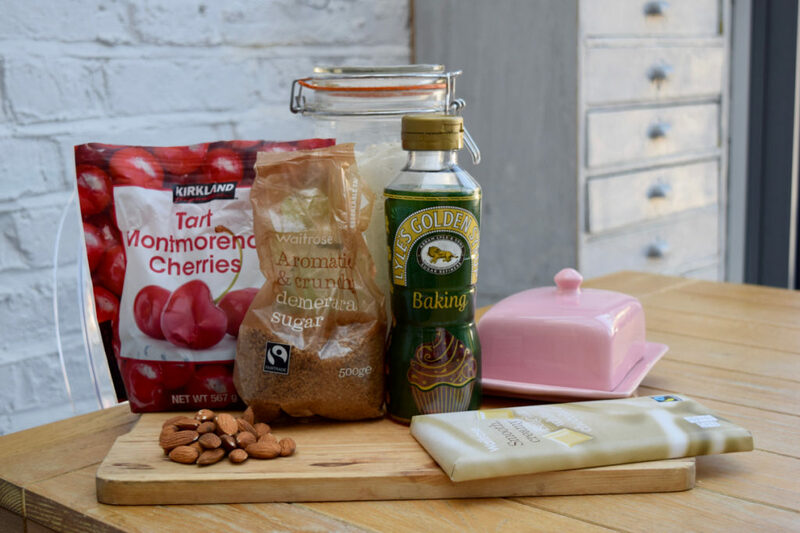 I have left out all the bits I don’t like *candied peel* and included some fantastic dried cherries and almond, but you can pretty much use any fruit or nuts you have to hand. These are folded into a simple mixture of butter, demerara sugar, flour and syrup to make an almost brandy snap like base. My Mother is borderline white chocolate dependent so I then coated the back of these cherry almond Florentines with plenty of it. Having always thought these were a pain in the arse to make and having spent a fortune buying Mum super expensive shop ones, I am pleased to report these are beyond easy. Some simple chopping, melting, then an eye kept on them when cooking, as they only take around 8 minutes. All that’s left is to do it leave the chocolate to set then you are ready to gift way. Or not, these are totally amazing, you may not feel like giving them away at all. 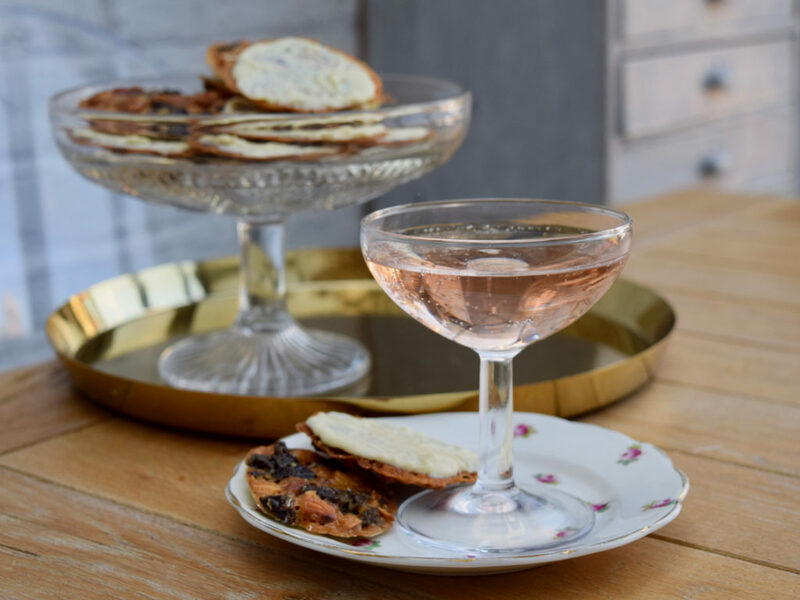 These Cherry White Chocolate Florentines are such a vintage treat, whether you are treating the Mother figure in your life, or just treating yourself, these crisp fruit, nut and chocolate delights come filled with love. From me to you. Pre heat your oven to 160 degrees fan assisted and line two baking sheets with greaseproof paper. 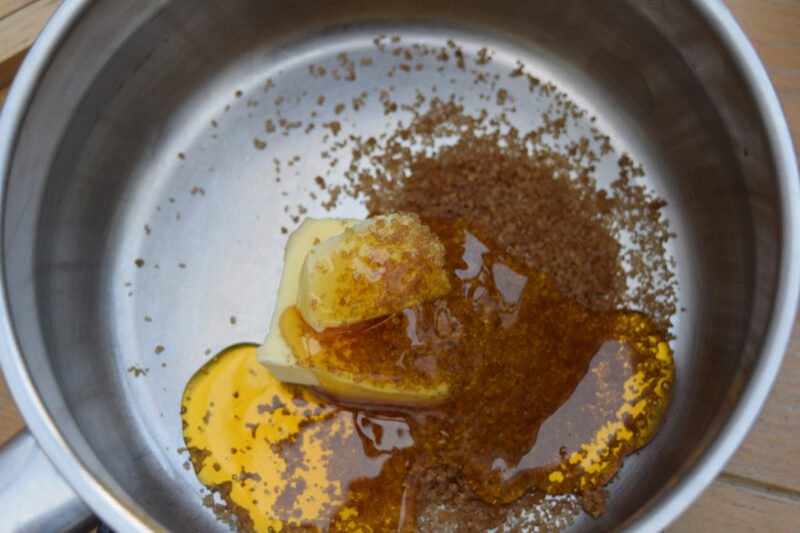 Take a saucepan and measure in the butter, demerara sugar and golden syrup. Heat on the stove over a low heat until the butter has melted. Take off the heat and stir. 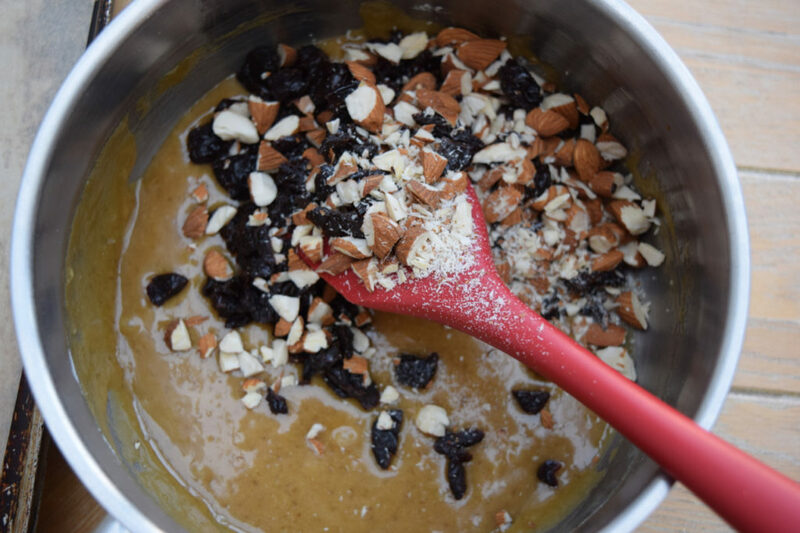 Fold in the flour then add the chopped almonds and cherries. Place heaped teaspoons of the mixture onto your lined baking sheets, leaving plenty of space for spreadage. Place into your pre heated oven for 8 to 10 minutes. 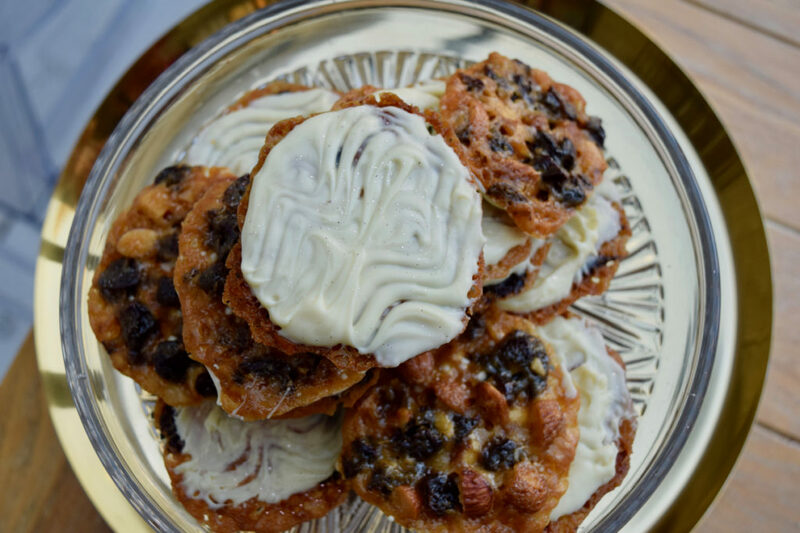 The cooked Florentines will be turning golden, have spread and be bubbling. Leave them on the baking paper until they are just set then remove to a cooling rack. Leave to cool completely. To melt the white chocolate place in a bowl and microwave in 30 second increments, mine only took 1 minute. Leave to meld together, stirring well. Or melt briefly over a pan of simmering water. Turn the florentine’s over so they’re upside down. Spoon on the melted white chocolate to the flat side and spread to the edges. Leave to cool for a moment then use the prongs of a fork to make a pattern in the chocolate. Leave to cool completely then devour. Store in an airtight tin for 3 to 4 days.